AJ Glass – Glass Supplied and Fitted. We are a family company and put customer service first, reinforced by quality, value and innovation. With over 100 years glazing experience between us – we are in a Glass of Our Own – with all types of glass supplied and fitted. 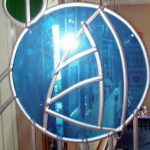 We supply and fit any type of glass to any type of structure. Home, business, shop, greenhouse or portacabin – if it’s glass we do it! 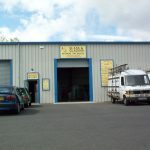 Our Glass Showroom is the biggest and best in Falkirk. It features the Rennie Mackintosh Crystal Collection and Giftware, plus Mirrors and Celtic Design Glassware. Decorative lead overlay work and colouring from your designs is our speciality. with over 1400 colours to choose from, there is one that’s right for you and your kitchen. AJ GLASS Splashbacks supply and fit splashback glass all over the UK and further a field with our courier deliveries in regional areas. We only use opti white glass for our coloured glass splashbacks for best results. We supply and fit glass splashbacks all over Scotland and the UK. Check our website gallery to see examples of our splashbacks fitted in customers’ kitchens.